Provide comfort for the family of Ronald Weir with a meaningful gesture of sympathy. 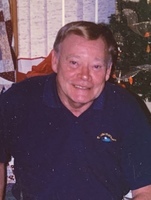 Ronald Alexander Weir of Thedford, formerly of Port Franks passed away on Saturday, February 23, 2019 at Strathroy Middlesex General Hospital in his 76th year. Loving husband of the late Mickey Couldridge-Weir (2009). Missed father of Karl & Craig; grandfather of Amelia and Grace all of the UK. Ron was an only child and is predeceased by his parents Mary Jane and Murray Weir. Ron was a member Royal Canadian Mounted Police, serving for over 32 years in Manitoba, Newfoundland and the Toronto area, rising to the rank of Sergeant. Ron had a great love of horses, owning and raising harness racers before his retirement where Ron spent much of his time golfing at Widder Station just outside of Thedford. Provide comfort for the family of Ronald Alexander Weir by sending flowers. The Toronto Division of the RCMP Veterans' Association sends it's sincerest condolences to Sgt. Weir's family and friends. RCMP Veterans Association - London, Ontario The London Division of the RCMP Veterans' Association extend our deepest sympathies to the family of Sgt. Weir.